If you’ve been around for a while, you know that I love a good makeup dupe. You may have perhaps read my most popular post, The Best Cheap Makeup, where I profess my love for my favorite drugstore makeup. I have also written two other drugstore makeup dupes posts – Splurge/Steal Beauty and Splurge/Steal – More Awesome Dupes! Since writing those dupe posts, I have found even more drugstore makeup dupes, but of course, I am running out of titles for my blog posts. So today is going to be as basic as ever – “drugstore makeup dupes.” It does the job, right? I guess I am going to have to think more creatively next time! Anyway, back to these dupes. I’m so excited about them… they are really good ones! I am very critical when it comes to a dupe and it absolutely needs to perform almost identical or be something you can use in lieu of. Urban Decay 24/7 Glide-on Eye Pencil vs. Rimmel ScandalEyes Waterproof Kohl Eyeliner – Honestly, I have no idea why anyone would pay $20 for an eyeliner pencil when they can get the same exact result from something that is $5. The Rimmel eyeliner goes on super black, creamy, and sets to stay put. It stays on my waterline for quite a long time. 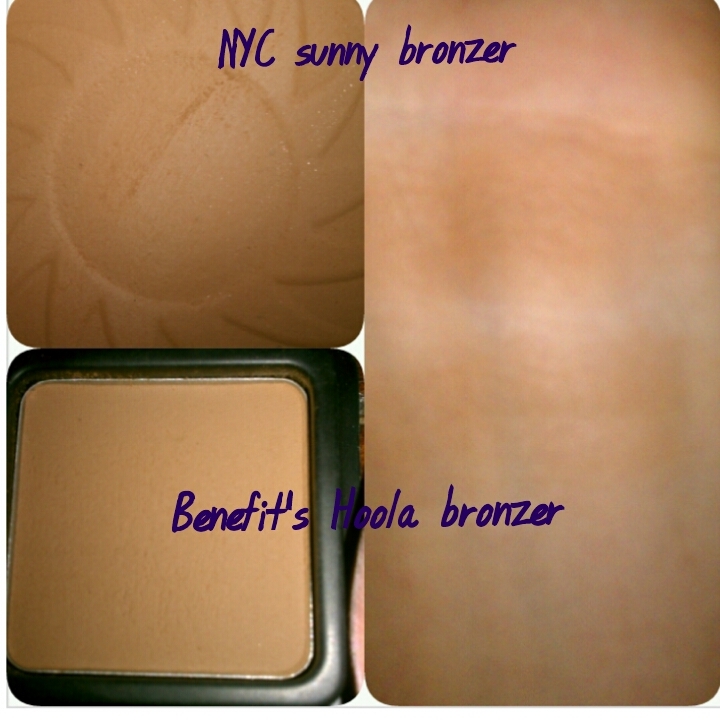 Benefit Hoola Bronzer vs. NYC Smooth Skin Bronzing Powder in Sunny – Having a nice, matte, non-orange bronzer is a little hard to find at the drugstore. Hoola is great for bronzing and light contouring, and this NYC bronzer is so darn similar! The only thing, this specific bronzer is a little hard to find. You have to keep your eye out for it, it’s so popular! This is a great swatch comparison of the two. 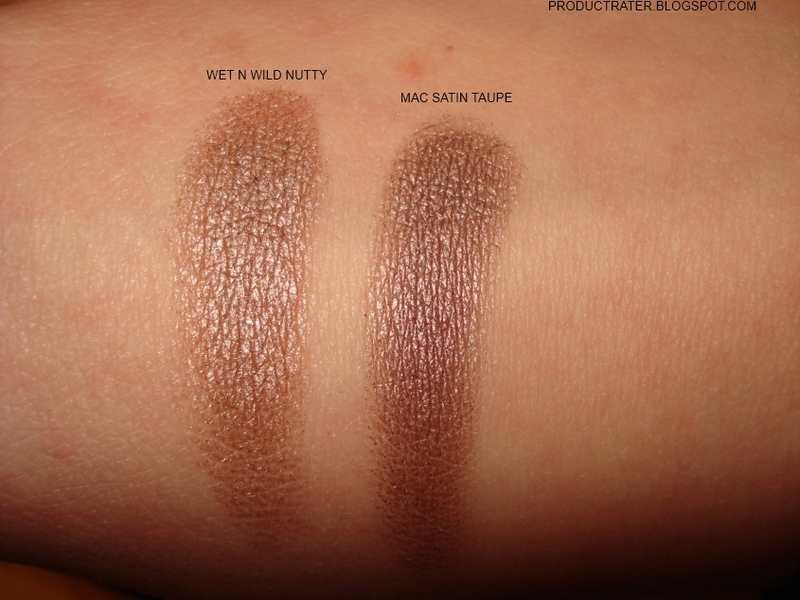 MAC Satin Taupe Eyeshadow vs. Wet ‘n Wild Single Eyeshadow in ‘Nutty‘ – Satin Taupe from MAC is one of those universally flattering eyeshadow shades. It looks fantastic on the lid or in the crease, and is easy to wear. It is one of my top favorite eyeshadows ever. But, friends, this single eyeshadow from Wet n’ Wild is literally the same. The only complaint I have with it is the packaging – I feel like the eyeshadow breaks really easily because of it. But it’s 99 cents so I will forgive them for that. Here is a swatch comparison. Beauty Blender vs. Real Techniques Miracle Complexion Sponge – Okay, I will say that this is not an exact dupe by any means. But I am mentioning this because I have been asked for a cheaper alternative to the beauty blender. I have tried tons of low end blending sponges, and this one is, by far, my favorite. I find that it feels a little bit more squishy than the beauty blender and kind of like memory foam. It’s really hard to explain. It also isn’t quite as durable as the beauty blender. But I’m definitely willing to forgive that for $6! I am rotating through the both of them when applying makeup – makes it much easier when it comes to always having a clean blending sponge. Anastasia Beverly Hills Brow Wiz vs. NYX Micro Brow Pencil – I wrote this post comparing these two products in depth. Basically, the NYX pencil is the closest I’ve found for half the price. I still love the Brow Wiz and continue to purchase it, but I throw the Micro Brow into the rotation for sure! Smashbox Photo Finish Foundation Primer vs. Maybelline Baby Skin Instant Pore Eraser Primer – This is another one of those where I have no idea why you would spend $36 on a primer. I had a deluxe sample of the Smashbox and used it up in comparison with the Maybelline Baby Skin. I honestly can’t tell the difference between the two. I also think the Monitstat Chafing Relief Powder Gel is very similar (yes, as awkward as that sounds). Check out this video I did a few years back when I talked about it. It’s the same price as the Maybelline, but more awkward to take to the register. You better believe I am making notes when I find a killer dupe and saving them all for another post. What are your favorite drugstore makeup dupes? Let me know, because, duh, I have to know!!! Splurge / Steal Beauty – More Awesome Dupes! Woop woop! I love these posts and this one came just in time for me because I’m heading to Target tomorrow for a few make up replacements. Thanks! Pining! Yay! I am always glad to help a sister out!!! Hope you love my picks! Totally going to Ulta to get some of these today! Woop woop! Let me know how you like them!! Oh man… this is awesome! I don’t like spending a fortune on makeup and this came at the perfect time because I’m planning on dumping all my makeup in October and buying fresh stuff. (I’m bad for using my products WELL beyond their expiry dates – so I buy new annually – that way I KNOW I’ve replaced items). The Wet ‘n Wild eyeshadow was most surprising – mostly because I’ve always thought of Wet N’ Wild as a crummy brand that preteens buy because they have no income. I guess I was wrong. The bronzer sounds fabulous – I’ll definitely have to get that one. Don’t feel bad! I hold onto products for a loooooong time, and much longer than I should. I get sentimental over them! LOL. And girl, Wet ‘n Wild totally rebranded and reformulated their products the last couple of years and their stuff is AWESOME! I know, I totally gave it the side eye, but they are a great drugstore brand now!! I’m hosting a beauty event at my church this Friday and wish I’d seen this post before I went shopping yesterday! Such a great list… pinning! I think I really want to try that primer!! I’ve had a few, loved some, didn’t like some and usually just didn’t have the time (or didn’t take the time) to use it. Do you notice a big difference when using primer?? I LOVE the Monistat Chaffing Gel! Love it. I have the Baby Skin too but actually like the chaffing gel a little better. And yes, why the heck would anyone spend that much $$ on a primer?! Love this — I’m going to look for the bronzer and eyeshadow this weekend. And I love that Monistat Chaffing Gel too, though I use it for, well, chaffing (one of the unpleasant side effects of being a back-of-the-pack distance runner). I have a hard time finding it in stores so I just order mine from Amazon, which also eliminates the cashier side-eye situation. Ahhhhh why haven’t I thought of ordering that stuff on Amazon?? lol! Try using it as a primer and you’ll love it!